At least 11 people have been killed after an amphibious “duck boat” sank on a lake in Missouri. The tourist vessel was carrying approximately 30 people on Table Rock Lake when it got into difficulty. Divers are still searching the lake for five people who are still missing. Seven others were rushed to hospital, with two of them being treated for serious injuries. Terrifying footage taken from a nearby show boat reveals a pair of duck boats struggling in the treacherous conditions, as onlookers begin to panic that they are going to sink. “They should have never came out here with them things,” one bystander can be heard saying. “That duck, I don’t think he’s gonna make it back,” another adds. As the video comes to an end, you can see the boat begin to sink, as the nose of the craft submerges beneath the heaving waves. “It’s going under,” someone says, as a member of staff on the show boat can be heard desperately attempting to summon help. “Crew! Anybody who can read me. I need a rope on the bow, and one on the starboard side,” he shouts. It is absolutely devastating to think of the horror those on board would be experiencing at that moment. Emergency Services were immediately called to the scene. “Seven patients [are in] the hospital and we do have some people still missing. So this is going to be an all night, into tomorrow [search],” Stone County Sheriff Doug Rader told reporters about 9.30pm. 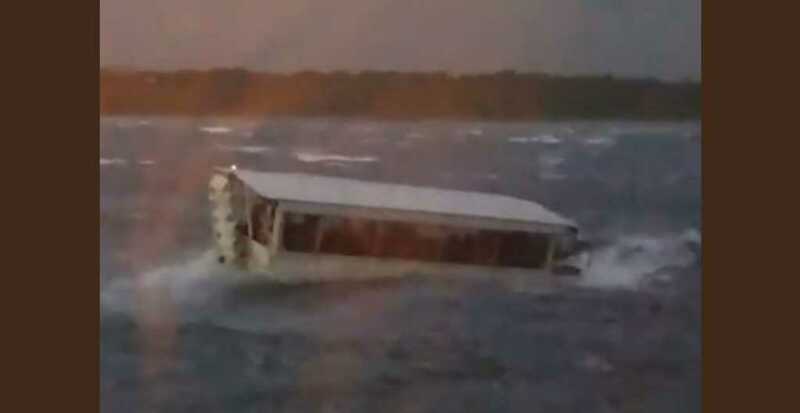 Another heart-thumping piece of footage was obtained by KYTV, taken from onboard the second duck boat as it struggled to escape the stormy waters. Rader later confirmed that there were children among the dead. He said that weather conditions on the lake began to worsen rapidly as a series of thunderstorms rolled through the area. “There’s nothing to slow down winds in an open area,” he added. According to CNN, an off-duty deputy who helped rescue many of those stricken out on the lake noted that lifejackets were available on board, though he didn’t comment on whether victims were wearing them. Suzanne Smagala, of Ripley Entertainment, the company that owns Ride the Ducks in Branson, said this was the first accident involving the duck boats for some 40 years. With that being said, duck boats have been involved in several fatal incidents across the world in recent years. In 2015, a Seattle duck boat collided with a bus, killing five college students. In 2002 four were killed when a duck boat sank in the Ottawa river. In 2016, a woman was killed when her motorcycle was struck by a duck boat in Boston. Scrolling through tweets about the “Ride the Ducks” boat capsizing. Tragic. Heartbreaking. Praying. Also struck by how many immediately try to personalize a tragedy. “I have been on those boats.” “I go to Table Rock Lake.” “I was in Branson.” An odd response to tragedy IMO. President Trump tweeted his condolences after hearing of the accident. “May God be with you all,” he wrote. Pray for all the families of the victims, and ask that the Lord would be with those who were injured in this tragic incident.